is a small, tropical-looking tree, seldom taller than 25 feet. 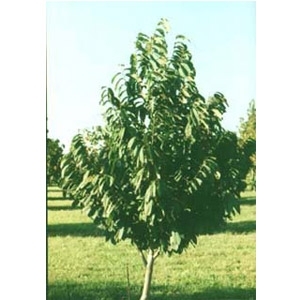 Grown in full sun, the Pawpaw tree develops a narrowly pyramidal shape with dense, drooping foliage down to the ground level. In the shade it grows tall, with a more open branching habit, horizontally held leaves, and few lower limbs. The delicious and nutritious fruit look like short, fat bananas. They have a fragrant aroma, a custardy texture, and a tropical taste.